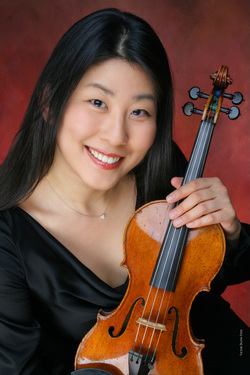 Amy Oshiro-Morales joined The Philadelphia Orchestra’s violin section in January 2008; prior to that she had held the Assistant Concertmaster position with the Saint Louis Symphony Orchestra. During the 2012-13 season, Ms. Oshiro held the acting Assistant Concertmaster title with The Philadelphia Orchestra. She also previously held the Associate Concertmaster chair of the Colorado Symphony and was Assistant Concertmaster of the Grant Park Orchestra (IL). She has also performed as a guest musician with the New York Philharmonic. Ms. Oshiro made her debut with the Chicago Symphony at the age of 12 and has appeared numerous times as a soloist with the Saint Louis Symphony, the Napa Valley Symphony, the Minnesota Sinfonia, The Central Ohio Symphony, and others. Ms. Oshiro began violin studies when she was three years old. She studied with Almita and Roland Vamos at Oberlin Conservatory, where she received the Dean’s Talent Award scholarship. She continued her studies at the Juilliard School with Robert Mann, the founder and former first violinist of the Juilliard Quartet. In the summers, Ms. Oshiro has been a guest artist at the National Orchestral Institute (MD), the Kingston Chamber Music Festival (RI), the Sun Valley Summer Symphony (ID), the Cactus Pear Music Festival (TX), the Grand Teton Music Festival (WY), the Philadelphia International Music Festival (PA), the New World Symphony (FL), and the Innsbrook Institute (MO), among others.